Dr David Bosanquet in the driving simulator. Even though every state in Australia tests for the use of methamphetamines (such as ice and speed) while driving until now there has been a lack of research evidence to support these policies and the related penalties. “In 2004, Victoria was the first state in the world to introduce random roadside saliva testing for drug use including the methamphetamines, and since then all other Australian states have followed,” said Dr David Bosanquet from the University’s School of Psychology and lead author of the study just published in Psychopharmacology. Over half a million Australians use methamphetamine or ‘meth’, particularly young men. Commercial truck drivers commonly use meth in order to stay awake over long distances. “In stark contrast to the wealth of research on drinking and driving safely there hasn’t been any clinical research comparing responses between heavily ‘drugged’ meth users and non drug-using drivers in lifelike driving scenarios. We have had to rely on epidemiological research which uses after-the-fact analyses of accidents or arrests,” Dr Bosanquet said. 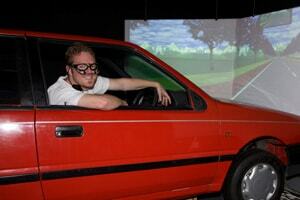 The current study compared the driving performance of participants who sat in a real car body in the laboratory and ‘drove’ through a convincingly realistic computer-simulated landscape complete with wraparound video footage. During their journey they navigated traffic lights, pedestrians and other vehicles while having their reaction times measured. The participants who volunteered for this study were current meth users and non-drug users. All participants were assessed for current drug use, drug dependence, and drug levels in saliva and blood as well as personality characteristics, sleepiness, and driving performance. The meth users were both more likely to go over the speed limit and spend more time speeding. They were also more likely to weave from side-to-side and were greater risk takers. “We found that the dangerous driving of users was not associated with their current blood levels of meth which varied widely. Instead their behaviours appear to be linked to long-term heavier use of meth as most of the drivers met the criteria for dependence. The study provides a methodology and platform for further research. It promises to help inform court proceedings and future road safety policy in Australia and jurisdictions overseas, such as the US, which can prosecute drug-using drivers. “Since roadside drug testing was first implemented millions of dollars have been spent to test, charge, and sentence those found guilty,” said Dr Bosanquet. “It’s important to understand the science behind this sort of initiative and this is the first step,” Dr Bosanquet said.